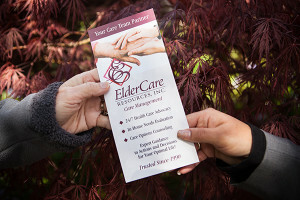 Your ElderCare Resources care manager will explore needs and options with the family or client during your care consultation. After considering medical, financial, and social factors, we will recommend a course of action. We may refer you to appropriate living arrangements or care services. ERI can also refer you to trusted local professionals, such as specialty services and health care providers. 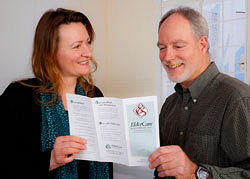 Our Just in Case℠ Plan includes an initial assessment and establishes our relationship so that care management services can be provided quickly (only if and when needed). The assessment includes a family meeting and home visit to determine choices and goals and to gather the information we need to meet any urgent needs. Being ready brings peace of mind – for you, and for those who care about you. You can be confident in our team of skilled financial experts’ ability to manage your affairs. Our daily money managers will get your bills paid, assist with household management and paperwork, create a budget, offer support with financial decisions, and help prevent or stop financial abuse. For clients with significant assets, we partner with certified financial planners to follow an appropriate investment plan. We set up a system that works for you so you can stay in control. Our certified fiduciaries serve as court-appointed guardians for persons of all ages who can’t make reasoned decisions. We implement person-centered care plans, protect and manage assets and income, and oversee the living situation. When: There are resources to cover initial and ongoing legal and fiduciary costs; and the person would benefit from care decisions made by a guardian. When: There are significant assets to protect; budgeting of assets is needed, both in the short and long run, in consideration of the client’s unique needs. Going out of town? We can keep watch while you are away. Our staff is on call 24 hours a day, every day, to provide care oversight. "I enjoy communicating with persons who have communication impairments. It's like inventing and using a unique language for each person. I use all kinds of tools to understand the values and needs of persons who have alter-abilities in speech and cognition. Often, my particular contribution to our clients is to make good fiscal plans and budgets. In making difficult choices on behalf of persons under guardianship and conservatorship, I use both decision analysis tools and listening from the heart. I believe that everyone has the right to have their own values carried out. I have lived in Eugene since 2008. After living in the Southwest for decades, I've finally found my forever home here in Eugene! "